How To Build Jumps for $35! I will post more pictures soon, but I was proud of how these turned out. I walked into Home Depot, all by myself, with no specific plans. Grabbed a bunch of random stuff and voila! Jumps! So the larger PVC pipes, 3 inches in diameter, make the standards. Just cut those in half, and you have 4 five-foot tall posts. Take the extra wood you have lying around (or two by fours, etc) and cut 16 sixteen inch sections. This won’t quite make a square box, but we are doing this ghetto-fab style. Nail four pieces together to make a box; repeat until you have 4 boxes. Drill two holes on one side of each of the boxes. Make sure they match the ubolt. You need a specific drill bit to match the diameter of the ubolt, this is where the husband/fake grandpa can be helpful, but really you can ask anyone at Home Depot to find the right bit if you don’t have one on hand. Look at the picutres for an example of how the jump should look. The empty space in the box is perfect for sandbags/flowers. Put the ubolt around the PVC pipe, and attach it through the holes in the board. Use a hand drill to tighten, if you do it by hand it won’t be stable enough. 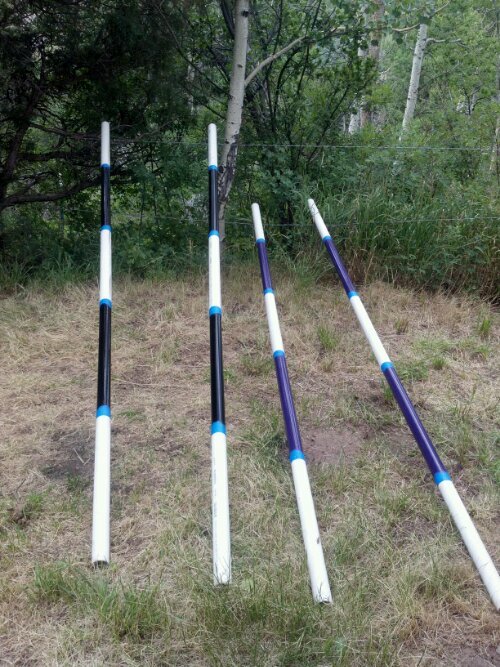 Up the sides of the poles drill holes to fit your jump cups every 3 inches, starting at 15 inches up from the base. Helpful note: The PVC pipes have print up one side. I turned the side with the print towards the inside of the jump, and drilled the holes along the print. That way it doesn’t show up in the pictures. I took duct tape/gorilla tape to the top of the pole to cover the gaping opening, the wrapped two strips of tape around the pole below the top to make a “cap.” Ghetto, but looked okay. The poles were the fun part. Be specific with your paint, and make sure you use painter’s tape, not just masking tape. The rustoleom paint that adheres to plastic looked really nice when done. I taped off the stripes every 2 feet, which made 2 painted stripes per pole. 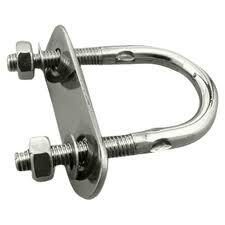 Attach your jump cups to the drilled holes, or rig your jump cups however you like, and you have ready to go jumps! 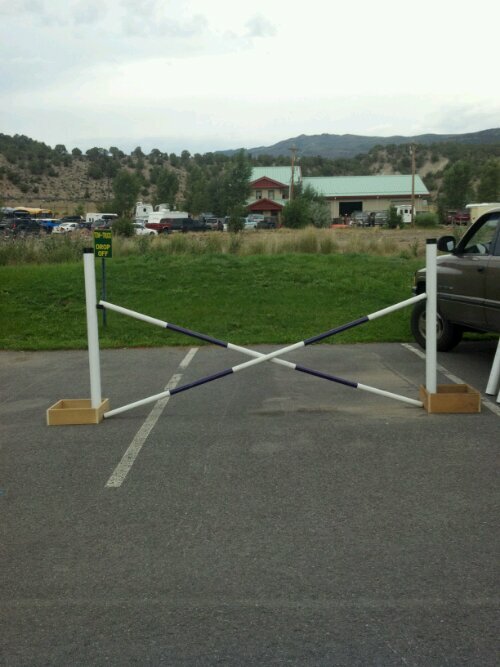 This entry was posted in DIY Horse Stuff and tagged Blm mustang, building horse jumps, Cello, Dani Neumann, diy horse jumps, Extreme Mustang Makeover, skylark horse horse programme, wild horse project. Bookmark the permalink.